Plot: It’s a story of a quest for knowledge in a world dominated by religious superstitions. 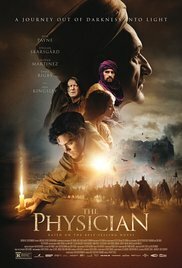 A young Briton travels from medieval London to Isfahan to join a Jewish madrassa and become a physician in a time when Christians are banned from Persia. As soon as his pants drop, trouble begins. Pros: Schmaltz with Ben Kingsley.